Now you can have Chef Roberts Gourmet Foods delivered to you! Please take advantage of our easy online ordering and enjoy! 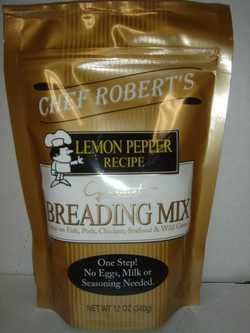 Chef Roberts breading mix is a one-step recipe. The milk, eggs and spices are already included in this delicious breading mix. It's unique flavor and light coating sets it apart from the other varieties. All you have to do is moisten your favorite foods and bread with Chef Roberts Breading Mix. Our 12oz. package provides you with enough breading mix to coat 6-8 lbs. of fish, chicken, pork chops, potato wedges, any wild game or vegetables. It has 0 cholesterol and 0 fat.